Moon Girl and Devil Dinosaur appear on the science-themed cover of Marvel's 2016 STEAM variants. Marvel Entertainment is kicking off the new school year with a special release of new comic book covers that promote science, technology, engineering, art and math (STEAM) while featuring five of its favorite, classic superhero characters. The comics will hit the shelves of comic book shops in November. But Marvel has released a sneak preview of some of the new cover art, which you can see in this gallery from our sister site Newsarama. Marvel's STEAM variants include re-creations of its classic characters and superheroes. 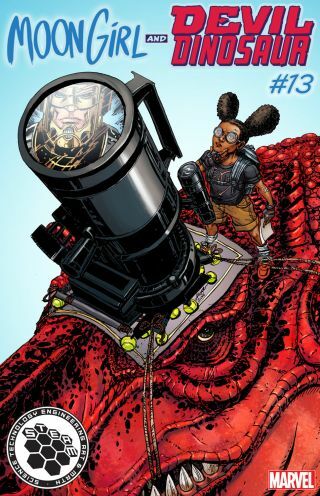 Moon Girl and Devil Dinosaur appear on the science cover peering at the cosmos through a dino head-mounted telescope, adding a fun new twist to the Golden Age original, Moon Girl, which was first published in 1947. Miles Morales, who took over the role of Spider-Man after Peter Parker's death in 2011, dangles from the ceiling using his web-shooters on the technology-themed variant cover. The art-themed variant Champions is based on the 1970s comic books. The latest Marvel characters also make an appearance on the new STEAM covers. The math-themed cover features Gwenpool, a character created in 2015 who combines Marvel's classic characters Deadpool and Gwen Stacy, one of Spider-Man's earliest girlfriends. On the engineering cover, female teenage science prodigy Riri Williams takes over the role of Iron Man with a new name, Ironheart. "Our characters have been exciting fans for ages," David Gabriel, Marvel's senior vice president of sales and marketing, said in a statement. "With our new STEAM Variants, we plan to continue to motivate our fans to explore their passions in the fields of science, technology, engineering, art, and math and present these disciplines through some of our favorite young heroes who are doing just that ─ following their dreams and preparing for the challenges that await them ahead."